Welcome back! It has been a while since we had the pleasure of the hosting the “Class of the Classes”, and I issue a warm welcome to the International 6 Meter Class. We hope this will be the start of another chapter in the history of the St. Francis Yacht Club and the 6 Meter Class. After all, the “6 Pounders” have been part of our club since our founding in 1926. The first International 6 Meter to appear on the North American continent did so at the Panama-Pacific International Exposition regatta on San Francisco Bay in 1915. Christened as Lady Betty, she was to race for a trophy given by President Woodrow Wilson. Because World War I was raging in Europe, only one challenger entered against us: Nurdug IV from King Christian X of Denmark. It was an uneven match. 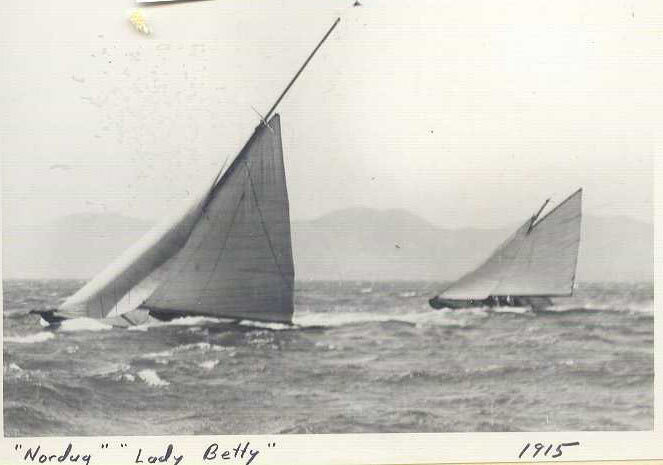 Nurdug IV, the then-European champion, was Marconi-rigged and handily defeated the small, gaff-rigged Lady Betty two races to one, with the only loss due to equipment failure in the stiff breezes. The winners took home the President Woodrow Wilson trophy, a large silver cup mounted on a California redwood burl. The trophy resided in the Royal Danish Yacht Club until 2002 when it was re-deeded to the Classics winner of the 6mR European Championships. Competition in California picked up in the late 20s and lasted through the 30s, with intense rivalry between the Northern and Southern California fleets. The most famous 6 Meter in the world was here at St. Francis Yacht Club: Maybe II. In 1929/30, we went on with Ay Ay Ay and Synnove, then with Naiad for the 1932 Olympic trials. The economic depression was hard on the class, but we were back again in 1938 with US 77 Fun, Strider (Lulu), Lucie, St. Francis II and Saga. World War II brought a temporary halt to our 6 Meter participation until 1968 when we acquired St. Francis IV. We built St. Francis V in 1973, St. Francis VI in 1976 and St. Francis VII in 1979 through 1981 along with Ranger and Ah Si Si. In 1983/4 we chartered Arunga, and for two years she became St. Francis VIII. St. Francis IX took us to Switzerland, France and Sweden. Through it all, St. Francis Yacht Club sailors were in the vanguard of the 6 Meter Class, winning the ISMA Worlds twice. The first win came in 1973 in Seattle aboard USA 100 St. Francis V with Tom Blackaller at the helm; the second in 1989 in Marstrand, Sweden aboard St. Francis IX with John Kostecki at the helm. St Francis Yacht Club boats also placed second twice - 1979 with St. Francis VII and 1985 with St. Francis IX and won the European Championships in 1990. These years of 6 Meter building and racing laid the foundation for our participation in the America’s Cup and 12 Meter arena. Now, we are seeing renewed interest in the Meter Classes, including the San Francisco Yacht Racing Challenge aboard the Super 12s and the naming of the International 8 Meter as the class of record for the Canada’s Cup. This just may be the beginning of a great new tradition as it marks the return of the class to San Francisco Bay.